Police officers in Anne Arundel County, Maryland arrived at a man’s home to confiscate his guns under the state’s Red Flag law. When he answered the door holding a gun, a fight ensued and they shot him dead. For months, we have been warning you about the so-called “red flag” bills that are being passed in states around the country. These laws allow family members, friends, and even complete strangers to turn gun owners into police to have their firearms confiscated. It is then up to the gun owner to prove that he or she deserves the right to keep and bear arms. It completely turns the justice system on its head. Under these laws, gun owners are presumed guilty until proven innocent. On Monday morning, police officers in Anne Arundel County, Maryland showed up confiscate 60-year-old Gary J Willis’ guns. A family member had called police and asked them to suspend Gary Willis’ gun rights, and the local police department was more than happy to oblige. Gary Willis was not charged or even accused of committing a crime. All of this happened because one extended family member told police she was worried that he was dangerous. No evidence, no proof… just one person’s word. And now, an innocent man is dead. Over one million New Jersey Gun owners defy Governor Murphy’s gun magazine ban & turn in demands of what some estimate is easily more than ten million now illegal standard capacity gun mags. New Jersey –- New Jersey’s standard capacity magazine ban is now in effect making New Jersey’s one million gun owners criminals in the eyes of the state. But in an act of mass definace, New Jersey residents refuse to comply. 2. Based on the testimony of one unrelated person. The confiscation order can be based on the testimony of only one person claiming that the gun owner poses a risk to the safety of himself or others. The law deceptively says that it has to be the testimony of a “family member.” such as the one in Washington State But “family member” is defined to include “former dating partners” and anyone who has ever lived with the defendant. So a jilted former boyfriend or girlfriend, or even a roommate from years ago, could easily set in motion the disarming of a lawful gun owner. Sometimes corporate policy will ban guns, other times only local franchise owners choose to ban them, not the company as a whole. Sometimes state or local law will supersede corporate policy, placating a business or franchise owner as anti-gun even if they’re not. Sometimes these legal restrictions or company decisions only apply to open carry, not concealed carry, or only apply to restaurants (or portions thereof) that serve alcohol. Corporate policies can be very different for employees than they are for patrons. So can storage in a car parked on company property or possession in a company’s parking lot. a program costing Australia taxpayers more than $500 million dollars. In the state of Victoria..... lone, homicides with firearms are now up 300 percent. in the past 12 months, since the criminals now are guaranteed that their prey is unarmed. while the resident is at home. evening news or hear your governor or members of the State Assembly disseminating this information. The Australian experience speaks for itself. laws affect only the law-abiding citizens. Take note Americans, before it's too late! In a speech, sometimes said to have been delivered in 1935, Hitler is supposed to have exclaimed: "This year will go down in history! For the first time, a civilized nation has full gun registration! Our streets will be safer, our police more efficient, and the world will follow our lead into the future!" This quote has been popular with Americans who defend the constitutional right to "keep and bear arms." It's cited to discredit those who support restrictions on firearms ownership and use. It's also cited to support the often-made charge that Hitler and his government curtailed gun ownership in Germany, and confiscated weapons held by private citizens. The truth is rather different. When Hitler and his National Socialist Party took power in early 1933, they inherited a somewhat restrictive firearms law that the liberal-democratic "Weimar" government had enacted five years earlier. In 1938 Hitler's government revised the earlier law by loosening those restrictions, thereby enhancing the rights of Germans to own weapons. The most thorough confiscation of firearms ever imposed on Germans was carried out at the end of the Second World War by the occupation forces of the United States and other victorious Allied powers. One can understand why many American gun owners want to believe this. They see in the current effort of their own government to take away their right to keep and bear arms a limitation of an essential element of their freedom and a move toward tyranny, and they want to characterize the gun-grabbers in the most negative way they can. Adolf Hitler has been vilified continuously for the past 60 years or so by the mass media in America, and certainly no politician or officeholder wants to be compared with him. If the gun-confiscation effort can be portrayed convincingly as something of which Hitler would have approved, it will have been effectively tarred. This identification of the inclination to deny citizens the right to keep and bear arms with National Socialism and Adolf Hitler has been strengthened recently by clever magazine advertisements which show Hitler with his arm outstretched in a Roman salute under a heading: “All in favor of gun control raise your right hand.” A Jewish group, Jews for the Preservation of Firearms Ownership (JPFO), quite noisy for its size, has been especially zealous in promoting the idea that the current gun-control effort in America has its roots in Germany during the Hitler period. This group has gone so far as to claim in several articles published in popular magazines read by firearms enthusiasts that the current restrictive legislation being proposed by the U.S. government is modeled on a gun-control statute enacted by Germany’s National Socialist government: the German Weapons Law (Waffengesetz) of March 18, 1938. Again, one can understand the motivation of the JPFO. Many non-Jewish firearms owners are well aware that the movement to restrict their rights is led and promoted primarily by Jews, and anti-Jewish feeling has been growing among them. 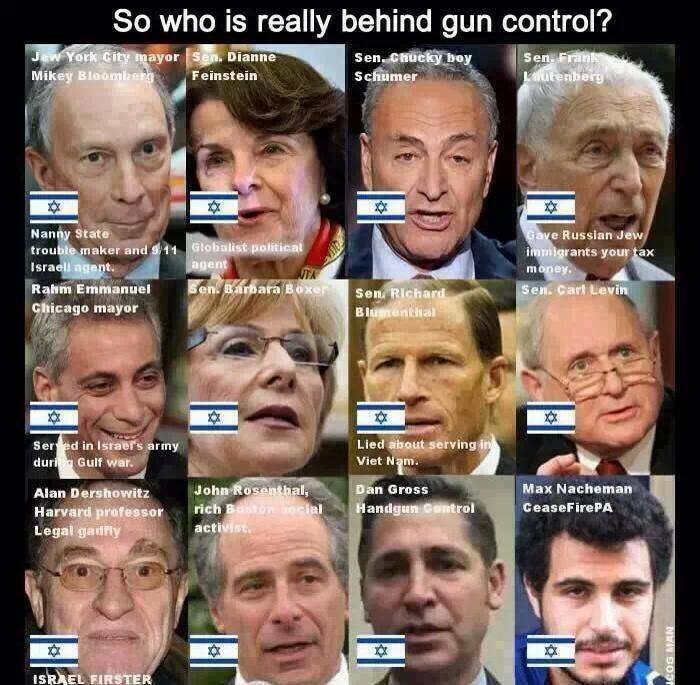 They know that the controlled news media, which are almost unanimously in favor of abridging or abolishing the Second Amendment, are very much under the influence of Jews, and they know that the most vocal anti-gun legislators in the Congress also are Jews. It is natural for a group such as the JPFO to mount a damage- control effort and attempt to prevent anti-Jewish feeling from becoming even stronger among gun owners. Their strategy is to deflect the blame from their kinsmen in the media and the government and direct it onto their most hated enemies, the National Socialists — or at least to create enough smoke to obscure the facts and keep the gun-owning public confused. Unfortunately for those who would like to link Hitler and the National Socialists with gun control, the entire premise for such an effort is false. German firearms legislation under Hitler, far from banning private ownership, actually facilitated the keeping and bearing of arms by German citizens by eliminating or ameliorating restrictive laws which had been enacted by the government preceding his: a left-center government which had contained a number of Jews. The National Socialist government of Germany, unlike the government in Washington today, did not fear its citizens. Adolf Hitler was the most popular leader Germany has ever had. Unlike American presidents, he did not have to wear body armor and have shields of bulletproof glass in front of him whenever he spoke in public. At public celebrations he rode standing in an open car as it moved slowly through cheering crowds. Communists made several attempts to assassinate him, and his government stamped down hard on communism, virtually wiping it out in Germany. Between upright, law-abiding German citizens and Adolf Hitler, however, there was a real love affair, with mutual trust and respect. The spirit of National Socialism was one of manliness, and individual self-defense and self- reliance were central to the National Socialist view of the way a citizen should behave. The notion of banning firearms ownership was utterly alien to National Socialism. In the German universities, where National Socialism gained its earliest footholds and which later became its strongest bastions, dueling was an accepted practice. Although the liberal-Jewish governments in Germany after the First World War attempted to ban dueling, it persisted illegally until it was again legalized by the National Socialists. Fencing, target shooting, and other martial arts were immensely popular in Germany, and the National Socialists encouraged young Germans to become proficient in these activities, believing that they were important for the development of a man’s character. Gun registration and licensing (for long guns as well as for handguns) were legislated by an anti-National Socialist government in Germany in 1928, five years before the National Socialists gained power. Hitler became Chancellor on January 30, 1933. Five years later his government got around to rewriting the gun law enacted a decade earlier by his predecessors, substantially amel ior a ting it in the process (for example, long guns were exempted from the requirement for a purchase permit; the legal age for gun ownership was lowered from 20 to 18 years; the period of validity of a permit to carry weapons was extended from one to three years; and provisions restricting the amount of ammunition or the number of firearms an individual could own were dropped). Hitler’s government may be criticized for leaving certain restrictions and licensing requirements in the law, but the National Socialists had no intention of preventing law-abiding Germans from keeping or bearing arms. Again, the firearms law enacted by Hitler’s government enhanced the rights of Germans to keep and bear arms; no new restrictions were added, and many pre-existing restrictions were relaxed or eliminated. At the end of the Second World War, American GIs in the occupying force were astounded to discover how many German civilians owned private firearms. Tens of thousands of pistols looted from German homes by GIs were brought back to the United States after the war. In 1945 General Eisenhower ordered all privately owned firearms in the American occupation zone of Germany confiscated, and Germans were required to hand in their shotguns and rifles as well as any handguns which had not already been stolen. In the Soviet occupation zone German civilians were summarily shot if they were found in possession of even a single cartridge. Jews, it should be noted, were not Germans, even if they had been born in Germany. The National Socialists defined citizenship in ethnic terms, and under Hitler Jews were not accorded full rights of citizenship. National Socialist legislation progressively excluded Jews from key professions: teaching, the media, the practice of law, etc. The aim was not only to free German life from an oppressive and degenerative Jewish influence, but to persuade Jews to emigrate. 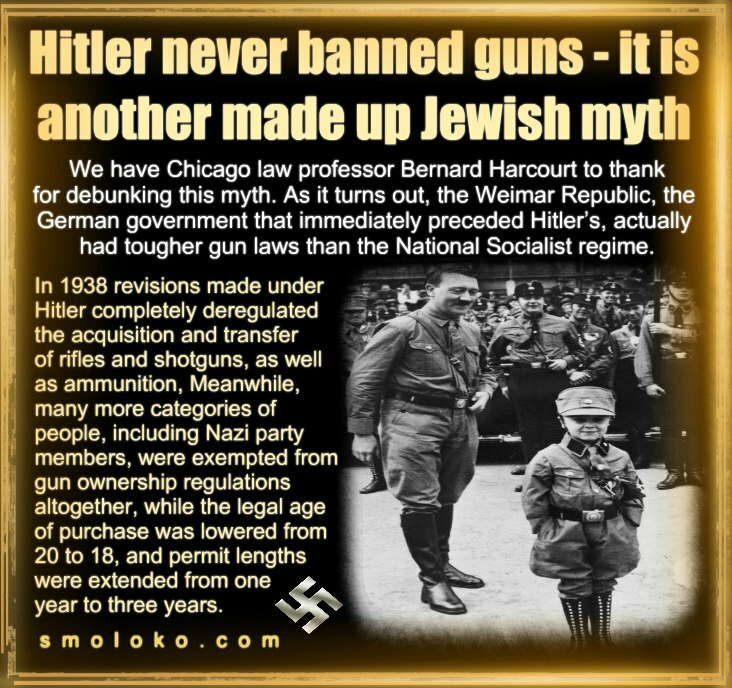 The German Weapons Law of March 18, 1938, specifically excluded Jews from manufacturing or dealing in firearms or munitions, but it did not exclude them from owning or bearing personal firearms. The exclusion of Jews from the firearms business rankled them as much as any other exclusion, and in their typically ethnocentric fashion they have misrepresented the law involved as an anti-gun law in an effort to cast their enemies in a bad light. It should be noted in passing that the restrictions placed on Jews by the National Socialists had the intended effect: between 1933 and 1939 two-thirds of the Jews residing in Germany emigrated, reducing the Jewish population of the country from 600,000 when Hitler became Chancellor in 1933 to 200,000 at the outbreak of the Second World War in 1939. Jews in the United States, looking at this period from their own narrowly focused viewpoint, have described these peacetime years of the National Socialist government as a time of darkness, terror, and regression, whereas for the German people it was a time of hope, joy, and spiritual and material renewal. Much the same type of distortion is seen in the portrayal of the United States in the early 1950s: the so-called “McCarthy Era.” Senator Joseph McCarthy (Republican, Wisconsin) used his position as chairman of the Senate’s Government Operations Committee to expose the widespread communist infiltration of the U.S. government and other U.S. institutions which had taken place during the Second World War. A substantial majority of the communists who were dragged reluctantly out into the light of day by his efforts were Jews. As a result, the controlled media always have portrayed the period as one of terror and repression, when everyone was frightened of Senator McCarthy’s “witch-hunt.” Of course, it was nothing of the sort to non-Jewish Americans, who were not intimidated in the least. History viewed through a Jewish lens — i.e., through media controlled by Jews — always is distorted in a way corresponding to Jewish interests and concerns. Both the German Weapons Law of March 18, 1938, enacted by the National Socialists, and the Law on Firearms and Ammunition of April 12, 1928, which was enacted by an anti-National Socialist government, are given below in full, first in facsimile and then in English translation. A little background information first, however, may help the reader to understand their significance. After Germany’s defeat in the First World War (a defeat in which Germany’s Jews played no small part, demoralizing the home front with demonstrations and other subversive activity much as they did in America during the Vietnam war), the Kaiser abdicated, and liberals and leftists seized control of the government in 1918. Hitler, recovering in a military hospital from a British poison-gas attack which had blinded him temporarily, made the decision to go into politics and fight against the traitors he felt were responsible for Germany’s distress. The tendency of Germany’s new rulers after the First World War was much the same as it is for the liberals in America today: they promoted cosmopolitanism, internationalism, and egalitarianism. By 1923 economic conditions in Germany had become catastrophic, and there was much public unrest. The communists had made major inroads into the labor movement and were a growing threat to the country. Hitler had indeed gone into politics, and his National Socialists battled the communists in the streets of Germany’s cities and gradually came to be seen by many patriotic Germans in the working class and the middle class as the only force which could save Germany from a communist takeover and total ruin. Hitler’s National Socialists continued to win recruits and gain strength during the 1920s. The communists, with aid from the Soviet Union, also continued to grow. The political situation became increasingly unstable as the government lost popular support. The government’s response was to substantially tighten up restrictions on the rights of German citizens to keep and bear arms. The Law on Firearms and Ammunition of April 12, 1928, was the most substantial effort in this regard. This law was enacted by a left-center government hostile to the National Socialists (the government was headed by Chancellor Wilhelm Marx and consisted of a coalition of Socialists, including many Jews, and Catholic Centrists). Five years later, in 1933, the National Socialists were in power, Hitler headed the government, and the communist threat was crushed decisively. The National Socialists began undoing the social and economic damage done by their predecessors. Germany was restored to full employment, degeneracy and corruption were rooted out, Jews and their collaborators were removed from one facet of national life after another, and the German people entered a new era of national freedom, health, and prosperity. Holders of a permit to carry weapons (Waffenschein) or of a hunting license do not need a Weapons Acquisition Permit in order to acquire a handgun. A hunting license authorizes its bearer to carry hunting weapons and handguns. Whoever carries a firearm outside of his dwelling, his place of employment, his place of business, or his fenced property must have on his person a Weapons Permit (Waffenschein). A permit is not required, however, for carrying a firearm for use at a police-approved shooting range. persons who for assault, trespass, a breach of the peace, resistance to authority, a criminal offense or misdemeanor, or a hunting or fishing violation were legally sentenced to a term of imprisonment of more than two weeks, if three years have not passed since the term of imprisonment. cartridges with .22 caliber, hollow-point bullets. That is the essence. Numerous other provisions of the law relate to firearms manufacturers, importers, and dealers; to acquisition and carrying of firearms by police, military, and other official personnel; to the maximum fees which can be charged for permits (3 Reichsmark); to tourists bringing firearms into Germany; and to the fines and other penalties to be levied for violations. The requirements of “trustworthiness” and of proof of need when obtaining a permit are troubling, but it should be noted that they were simply carried over from the 1928 law: they were not formulated by the National Socialists. Under the National Socialists these requirements were interpreted liberally: a person who did not fall into one of the prohibited categories listed above was considered trustworthy, and a statement such as, “I often carry sums of money,” was accepted as proof of need. The prohibitions of spotlight-equipped rifles and hollow-point .22 caliber ammunition were based on considerations that the former were unsporting when used for hunting, and the latter were inhumane. When you have read the two laws mentioned here, you will understand that it was Hitler’s enemies, not Hitler, who should be compared with the gun-control advocates in America today. Then as now it was the Jews, not the National Socialists, who wanted the people’s right of self- defense restricted. You will understand that those who continue to make the claim that Hitler was a gun-grabber are either ignorant or dishonest. And you will understand that it was not until 1945, when the communist and democratic victors of the Second World War had installed occupation governments to rule over the conquered Germans that German citizens were finally and completely denied the right to armed self-defense. Most U.S. Federal gun control legislation has been written, introduced, and sponsored by Jewish Congressmen and Jewish Senators. 1968: The Gun Control Act of 1968 comes from Congressman Emanuel Celler’s House bill H.R.17735. It expands legislation already attempted by the non-Jewish Senator Thomas Dodd. America’s biggest and most far-reaching gun law came from a Jew. 1988: Senator Howard Metzenbaum sponsors Senate bill S.1523. It proposes legislation turning every violation of the Gun Control Act of 1968 into a RICO predicate offense, allowing a gun owner to be charged with federal racketeering offenses. 1993: Senator Howard Metzenbaum sponsors Senate bill S.653. It bans specific semiautomatic rifles, but also gives the Secretary of the Treasury the power to add any semiautomatic firearm to the list at a later date. February, 1994: The Brady Law, which requires waiting periods to buy handguns, becomes effective. Senator Howard Metzenbaum wrote the Brady Bill. Senator Metzenbaum sponsored the bill in the Senate. The sponsor of the bill in the House was Congressman Charles Schumer. 1994: Senator Howard Metzenbaum introduces S.1878, the Gun Violence Prevention Act of 1994, aka “Brady II.” Congressman Charles Schumer sponsored “Brady II” sister legislation [H.R. 1321] in the U.S. House of Representatives. September, 1994: The Violent Crime Control and Law Enforcement Act of 1994 goes into effect, including a provision that bans the manufacture and possession of semiautomatic rifles described as “assault weapons.” [Note: true assault weapons are fully automatic, not semiautomatic]. That gun-ban provision was authored in the Senate by Senator Dianne Feinstein and authored in the House by Congressman Charles Schumer. September, 1996: The Lautenberg Domestic Confiscation provision becomes law. It is part of a larger omnibus appropriations bill. It was sponsored by Senator Frank Lautenberg. It bans people convicted of misdemeanor domestic violence from ever owning a gun. 1997: Senate bill S.54, the Federal Gang Violence Act of 1997, proposes much harsher sentences for people violating minor gun laws, including mandatory prison sentences and forfeiture of property. It was introduced by Senator Dianne Feinstein and Senator Hatch, among others. It returns the idea of turning every violation of the Gun Control Act of 1968 into a RICO predicate offense. January, 1999: Senator Barbara Boxer introduces bill S.193, the American Handgun Standards Act of 1999. January, 1999: Senator Herbert Kohl introduces bill S.149, the Child Safety Lock Act of 1999. It would require a child safety lock in connection with transfer of a handgun. February,1999: Senator Frank Lautenberg introduces bill S.407, the Stop Gun Trafficking Act of 1999. February, 1999: Senator Frank Lautenberg introduces S.443, the Gun Show Accountability Act of 1999. March, 1999: Senator Frank Lautenberg introduces bill S.560, the Gun Industry Accountability Act of 1999. March, 1999: Senator Dianne Feinstein introduces bill S.594, the Large Capacity Ammunition Magazine Import Ban Act of 1999. May, 2000: Senators Feinstein, Boxer, Lautenberg, and Schumer sponsor Senate bill S.2515, the Firearm Licensing and Record of Sale Act of 2000. It is a plan for a national firearms licensing system. January, 2001: Senators Feinstein, Schumer, and Boxer sponsor Senate bill S.25, the Firearm Licensing and Record of Sale Act of 2001. It is a nation-wide gun registration plan [apparently there were two versions of that Firearm Licensing and Record of Sale Act bill]. May, 2003: Senators Feinstein, Schumer, Boxer, and others introduce legislation that would reauthorize the 1994 federal assault weapons ban, and, close a loophole in the law that allows large-capacity ammunition magazines to be imported into the U.S. The ban expired in September, 2004. October, 2003: Senators Feinstein, Lautenberg, Levin, and Schumer co-sponsor bill S.1774, designed to stop the sunset [ending] of the Undetectable Firearms Act of 1988. March, 2005: Senator Frank Lautenberg introduces bill S.645, “to reinstate the Public Safety and Recreational Firearms Use Protection Act,” in other words, to reinstate the 1994 assault-rifle ban [also known as the “Violent Crime Control and Law Enforcement Act of 1994”] which expired in late 2004. March, 2005: Senator Dianne Feinstein introduces bill S.620, “to reinstate the Public Safety and Recreational Firearms Use Protection Act,” in other words, to reinstate the 1994 assault-rifle ban [also known as the “Violent Crime Control and Law Enforcement Act of 1994”] which expired in late 2004.
the stuff that made this country rise from wilderness into the miracle that it is. As I have stood in the crosshairs of those who target Second Amendment freedoms, I've realized that firearms are not the only issue. No, it's much, much bigger than that. I've come to understand that a cultural war is raging across our land, in which, with Orwellian fervor, certain acceptable thoughts and speech are mandated. For example, I marched for civil rights with Dr. King in 1963 - long before Hollywood found it fashionable. But when I told an audience last year that white pride is just as valid as black pride or red pride or anyone else's pride, they called me a racist. I've worked with brilliantly talented homosexuals all my life. But when I told an audience that gayrights should extend no further than your rights or my rights, I was called a homophobe. I served in World War II against the Axis powers. But during a speech, when I drew an analogy between singling out innocent Jews and singling out innocent gun owners, was called an anti-Semite. Everyone I know knows I would never raise a closed fist against my country. But when I asked an audience to oppose this cultural persecution, I was compared to Timothy McVeigh. From Time magazine to friends and colleagues, they're essentially saying, "Chuck, how dare you speak your mind. You are using language not authorized for public consumption!" But I am not afraid. If Americans believed in political correctness, we'd still be King George's boys -- subjects bound to the British crown. In his book, "The End of Sanity," Martin Gross writes that "blatantly irrational behavior is rapidly being established as the norm in almost every area of human endeavor. There seem to be new customs, new rules, new anti-intellectual theories regularly foisted on us from every direction. Underneath, the nation is roiling. Americans know something without a name is undermining the nation, turning the mind mushy when it comes to separating truth from falsehood and right from wrong. And they don't like it." need not ..... tell their patients that they are infected. that's out of bounds now. Dr. King said "Negroes." Jimmy Baldwin and most of us on the March said "black." But it's a no-no now. For me, hyphenated identities are awkward ... particularly "Native-American." I'm a Native American, for God's sake. I also happen to be a blood-initiated brother of the Miniconjou Sioux. On my wife's side, my grandson is a thirteenth generation native American ... with a capital letter on "American." Finally, just last month ... David Howard, head of the Washington D.C.
Office of Public Advocate, used the word "niggardly" while talking to colleagues about budgetary matters. Of course, "niggardly" means stingy or scanty. But within days Howard was forced to publicly apologize and resign. As columnist Tony Snow wrote: "David Howard got fired because some people in public employ were morons who (a) didn't know the meaning of niggardly, (b) didn't know how to use a dictionary to discover the meaning, and (c) actually demanded that he apologize for their ignorance." me: Why did political correctness originate on America's campuses? And why do you continue to tolerate it? Why do you, who're supposed to debate ideas, surrender to their suppression? But what can you do? How can anyone prevail against such pervasive social subjugation? The answer's been here all along. I learned it 36 years ago, on the steps of the Lincoln Memorial in Washington, DC, standing with Dr. Martin Luther King and two hundred thousand people. You simply ... disobey. Peaceably, yes. Respectfully, of course. But when told how to think or what to say or how to behave, we don't. who learned it from Gandhi, and Thoreau, and Jesus, and every other great man who led those in the right against those with the might. A few years back I heard about a rapper named Ice-T who was selling a CD called "Cop Killer" celebrating ambushing and murdering police officers. It was being marketed by none other than Time/Warner, the biggest entertainment conglomerate in the world. Police across the country were outraged. Rightfully so-at least one had been murdered. Killer"- every vicious, vulgar, instructional word. "I GOT MY 12 GAUGE SAWED OFF. I GOT MY HEADLIGHTS TURNED OFF. I'M ABOUT TO BUST SOME SHOTS OFF. I'M ABOUT TO DUST SOME COPS OFF..."
It got worse, a lot worse. I won't read the rest of it to you. But trust me, the room was a sea of shocked, frozen, blanched faces. The Time/Warner executives squirmed in their chairs and stared at their shoes. They hated me for that. Then I delivered another volley of sick lyric brimming with racist filth, where Ice-T fantasizes about sodomizing two 12-year old nieces of Al and Tipper Gore. Well, I won't do to you here what I did to them. Let's just say I left the room in echoing silence. When I read the lyrics to the waiting press corps, one of them said "We can't print that." "I know," I replied, "but Time/Warner's selling it." Two months later, Time/Warner terminated Ice-T's contract. I'll never be offered another film by Warner's, or get a good review from Time magazine. But disobedience means you must be willing to act, not just talk. When someone you elected is seduced by political power and betrays you .. petition them, oust them, banish them. So that this nation may long endure, I urge you to follow in the hallowed footsteps of the great disobedience's of history that freed exiles founded religions, defeated tyrants, and yes, in the hands of an aroused rabble in arms and a few great men, by God's grace, built this country. My personal preference for a self-defense handgun is a Glock pistol. Glock pistols are as simple as revolvers to operate, reliable and almost indestructible. Plus, they provide increased magazine capacity and are safe. They are also very easy to disassemble and clean. And most importantly, they go "bang" when you pull the trigger. Some ladies might find the Glock grips to be a little bulky for their hands—except for the Glock 42 and 43, which most ladies should find quite comfortable. But most women should be able to safely and confidently shoot the majority of Glock 9mm pistols. Favorite options in Glock pistols include the Glock 42 in .380 ACP; Glock 17, 19, 26 and 43 in 9mm Luger (also called 9mm Parabellum or 9x19); the Glock 22, 23 and 27 in .40 Smith & Wesson; the Glock 21, 30 (and 30S) and 36 in .45 ACP; and the Glock 20 and 29 in 10mm Auto. The 1911 .45 ACP (I prefer Colt, Kimber or Springfield Armory) has been proven to be an extremely effective self-defense sidearm for over a century. But I don't recommend the 1911 for beginners. And, yes, for some people, a revolver might still be the preferred handgun. It has no external magazine to worry about losing; it is very dependable and reliable; it is easy to clean; and it is simple to operate. NYPD expert Frank McGee says the typical police gunfight conforms to a “rule of three”: 3 rounds, 3 yards, and 3 seconds. So in most real-life situations, the increased firepower of a high-capacity magazine doesn't even come into play. In dangerous game territory, you will need the power of a 10mm Auto, .357 Magnum, .44 Special, .44 Magnum, .45 ACP, .45 Long Colt or even a .454 Casull. These calibers are not for the limp-wristed, but when one is facing a Brown Bear, it is what one will need to survive. Plus, when your life's on the line, you’ll never feel the recoil. But, truthfully, I would hate to face a Brown Bear (includes the Grizzly and Kodiak) with a handgun of any caliber. These creatures are the fiercest and most formidable animals on the North American Continent (along with the Polar Bear, of course). Against a Brown Bear, I would hope I had a big game rifle or shotgun handy. For a .22 LR rifle (which is great for hunting small game), I prefer the Ruger 10/22 semi-auto. A Marlin model 60 tube-fed .22 LR is also very effective. The CZ model 455 bolt-action rifle just might be the most accurate factory .22 LR on the market. And I absolutely love my Remington American bolt-action rifle in .22 WMR. My all-time favorite .22 rifle is a Remington Nylon 66 in Mohawk Brown (which hasn't been manufactured in a long, long time). But that's because of sentimentality: It was my very first rifle. My dad gave one to me on my 12th birthday, and over the next several years, I fired over 50,000 rounds through it. I finally sold it (which I have regretted to this very day). But I found one in like-new condition (believe it or not) at a Montana gun show recently, and having a Nylon 66 in my possession again brings me great delight. But from a practical standpoint, I believe the Ruger 10/22 stands alone at the top of the heap.